Chris Jacobs took the reins at Barron & Jacobs last year after more than 31 years with the company. Chris Jacobs has construction in his blood. After graduation, he came on board full-time and worked his way up the chain, serving long stints as general manager of construction, then general manager of the whole company, before taking the reins from his father. But he also has an appreciation of history and tradition, and Barron & Jacobs is steeped in both, starting with its offices in an 1895 Victorian home in downtown Northampton, purchased from the city’s historical society and restored to its original look. Behind that home sits a carriage house that once sheltered the first car-repair garage in Northampton — a garage visited frequently by Amelia Earhart early in her flight career, to learn about reciprocating engines. That sort of history reflects the value that Cecil Jacobs, who’s known as “Jake,” places on the historical and architectural integrity of a building — a quality that has informed his company’s work and helped him forge a pioneering name in design-build construction — a tradition Chris Jacobs is excited to continue. His father established a philosophy at the company that whatever enhances a home should not take away from it — to have alterations and additions look like they’ve been there from day one, and to duplicate existing architecture and at the same time bring in modern conveniences. Cecil Jacobs began laying the foundation for his future company in 1963 when he completed his tour of duty in Vietnam with the 6143rd Engineering Group, and went to work as a designer for the Architectural Building Products Division of Reynolds Metals Co. (also known as Reynolds Aluminum). In the mid-’70s, he was appointed vice president of the division, overseeing the development, sales, and marketing of energy-conserving building products. He loved working there. But his future started to shift when, in the early 1980s, David Reynolds, the company’s president, asked a question: is there another market for us other than remodeling and building new homes? In other words, is there something remodelers weren’t doing because it was too big, and that homebuilders didn’t want to do because it involved existing structures? This whole-house remodel in Longmeadow is an example of the way Barron & Jacobs updates homes while retaining their original character. That was the birth of design-build. Jacobs was tasked with investigating the feasibility of a third major market that would encompass whole-home renovations and other major projects beyond the scope of smaller-scale remodeling. Over a two-year period, he conducted that study for Reynolds, establishing test locations in Springfield, Boston, and California, and became convinced there was a significant market. However, Reynolds retired soon after, and the new president had virtually no interest in the project. Then, In 1986, the head of Jacobs’ division, Jim Barron, retired, and Jacobs, at age 45, felt that was a good time for him to leave as well. So after the company agreed that he could pursue and develop his design-build research on his own, Jake launched his own firm with his wife, Kathleen, putting Barron’s name on the door symbolically, to honor his mentor. The company has benefited from the fact that Western Mass. isn’t a hotbed of new building, but there are plenty of older homes in need of renovation, meaning existing structures take on a higher value than they would in a more booming region for new construction. It takes not only skill to tackle whole-home remodels, he said, but also the personal touch and flexibility to interact with the homeowner, who may change their minds several times during a project. But, generally, detailed planning and productive shopping create a strong foundation for a successful remodel. 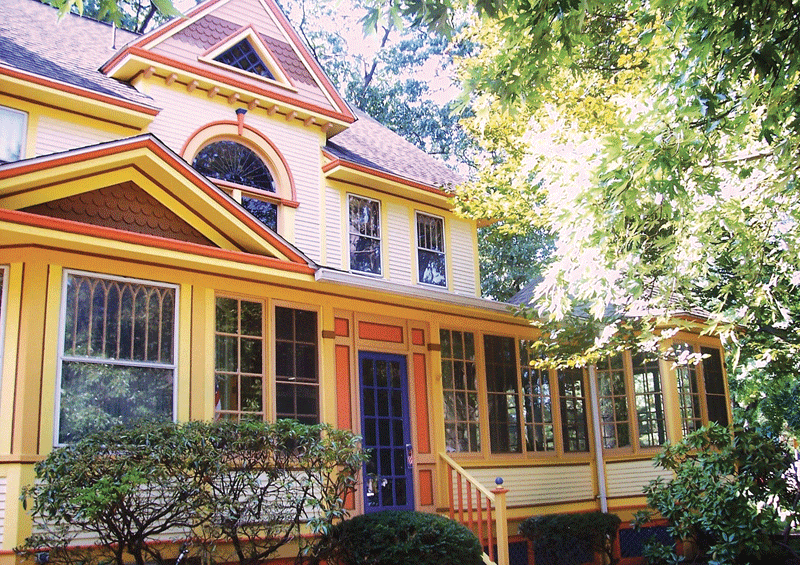 In addition to home remodeling and whole-house renovations, Barron & Jacobs’ portfolio includes additions, add-a-levels, kitchen and bathroom remodels, screened porches and porch enclosures, three-season rooms, sunrooms and conservatories, garages and carriage houses, attic and basement conversions, as well as business renovations and expansions. Meanwhile, the firm has strived to develop a reputation as an environmentally friendly builder, both in its emphasis on energy-efficient insulation, windows, and other materials, and through an extensive focus on recycling building materials. Through all of this, the company, which boasts 15 employees, continues to grow, with Jacobs and co-designer Adam Skiba — who comes from an architectural background and has been on board for a year and a half — looking to add another designer this year. And, of course, the new president is already eyeing the third generation of leadership at the company, although that transition is far off — specifically, his 5-year-old adopted son. The construction sector has always been a good barometer when it comes to the economy and what may happen with it in the foreseeable future. And this historical trend is one of many reasons why cautious optimism abounds in the region. Indeed, many firms report that they have a number of projects on the books for the year ahead and beyond, and that these projects involve a number of economic sectors. Gagliarducci Construction in Springfield has been in business since 1916, and the fourth-generation, family-owned company has had to switch its focus many times over the years to keep pace with change. It specializes in excavation, earth moving, site work, and mobile crushing of stone, concrete, and asphalt, and the majority of its current projects are centered in educational and healthcare settings. And it is extremely busy, reflective of a trend involving many players within the broad construction sector — one that is generating a good deal of optimism within the industry, and probably outside as well, because the sector has historically been a good barometer regarding the economy and what will happen with it. 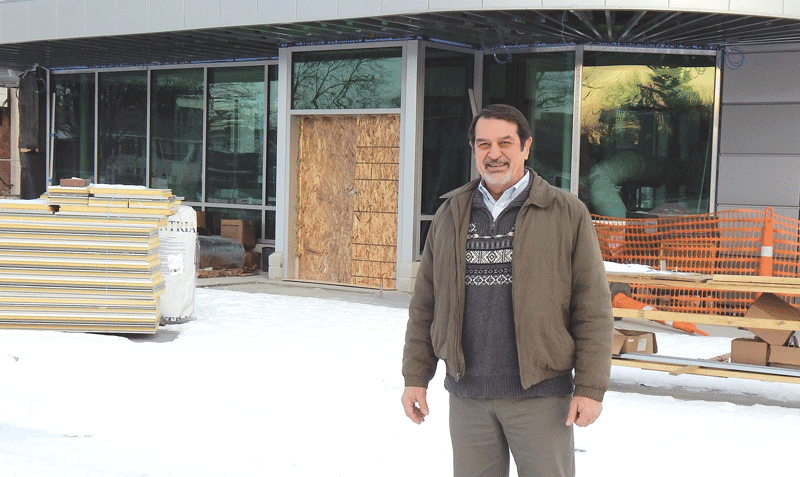 Eric Forish, president of Forish Construction Inc. in Westfield, said his firm has also fared well. “We’re celebrating our 70th year in business, and the last few years have been good ones; I credit that to our staff and expect that work in the commercial construction industry will continue to move in a positive direction,” he told BusinessWest, noting that the company typically has six or seven major projects taking place simultaneously. 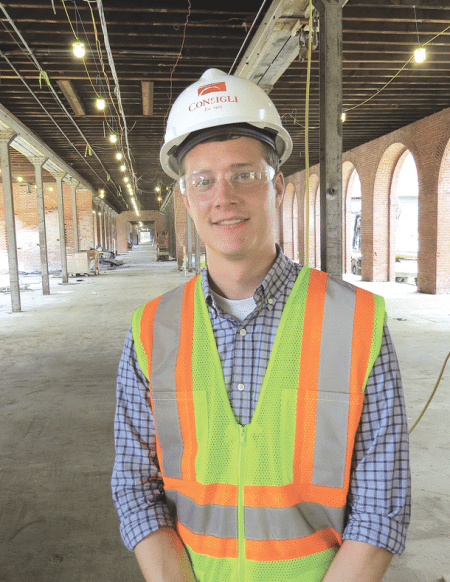 Holyoke-based Daniel O’Connell’s Sons Inc. also reports that 2016 has been a good year. The company also has offices in Franklin, New Haven, Conn., and Kingston, N.Y., and President Jeff Bardell is often on the road. He told BusinessWest that entirely different dynamics exist in Eastern and Western Mass. “Things are booming in the Boston area inside of Route 128. It’s obvious to drivers because there are so many cranes up,” Bardell said. Construction is also taking place in Western Mass., but not at the same level, and work in the public sector has declined. “Work has been pretty steady here for the past few years, but the amount of roadwork, wastewater-treatment work, and public infrastructure spending has decreased over the past 12 months,” Bardell went on, noting that work in that sector was much more prevalent four or five years ago. However, institutional jobs have filled the gap. “Colleges are still spending money, and we have done some nice projects,” he said. Bardell believes some people are waiting for the work on Interstate 91 and the MGM casino in Springfield to be complete before launching new projects. 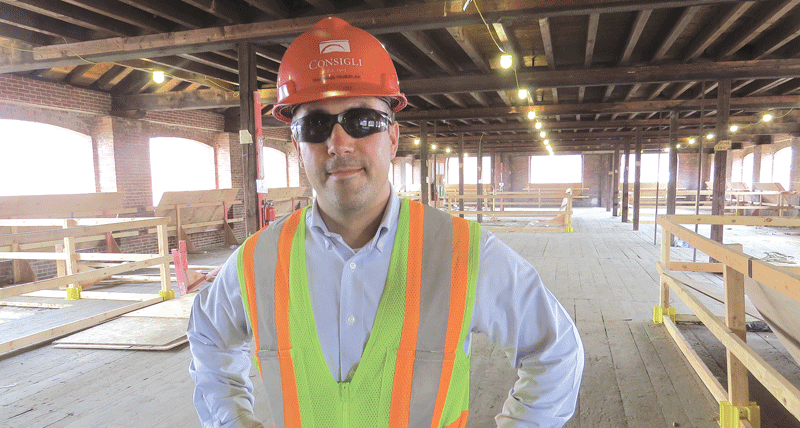 “A lot of people are looking at Springfield and hoping redevelopment will occur when the casino is finished,” he said, adding that one of O’Connell’s largest jobs in Springfield is the $60 million Union Station intermodal transportation center. Eric Forish says the $4 million, LEED-certified Westfield Transit Pavilion at Elm and Arnold streets is one of many projects his firm is working on at present. It includes a 120,000-square-foot historical renovation to the old station in the downtown Railroad Historic District. The project has been complex and includes construction of a new, 24-bay bus terminal; a 480-car parking facility; and upgrades to the landscaping and hardscapes around the area. Before the work began, Union Station consisted of two vacant buildings: a three-story terminal and a two-story baggage building that were both constructed in 1926. “We’ve been working vigorously to wrap up the project and are very close to being done,” Bardell said, adding that he expects that to happen in the first quarter of 2017. For this edition and its focus on construction, BusinessWest looks at a host of projects keeping commercial builders busy, as well as what they have lined up for the future. Bardell said O’Connell recently completed new residence halls at Amherst College. Four new dorms were erected as part of a greenway campus project, which will include demolishing the old dorms and building a 250,000-square-foot science center and expansive greenway along the full length of the landscape that can be used for recreation and relaxation. Jerome and Jay Gagliarducci say they have work booked into 2018 and expect to be very busy in the coming year. Another project at UMass Amherst will be completed in January, but right now work is still underway on its historic South College building. 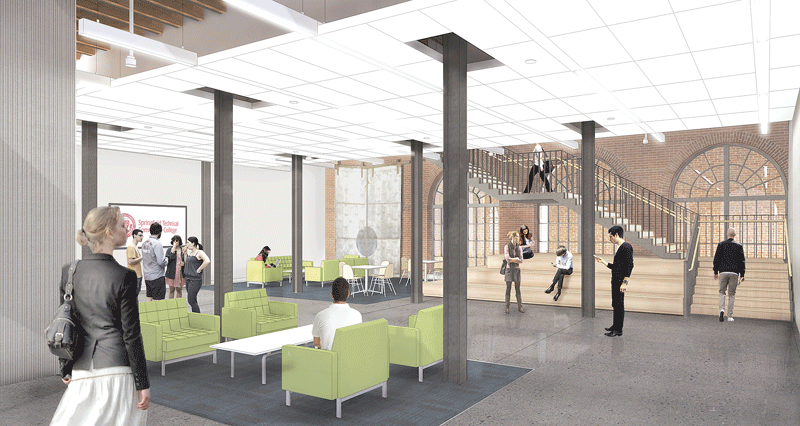 It includes a renovation of 30,000 square feet in the structure, built in 1886, and a four-story, 67,500-square-foot addition that will provide new common areas, faculty offices, classrooms, and an auditorium. The company has other ongoing projects in the educational sector. It just finished a $110 million job at Vassar College centered around an 80,000-square-foot Bridge Building that spans two sections of campus terrain and connects to the school’s Olmsted Hall via a two-level skywalk. In addition, a $2 million renovation and addition to Philips Exeter Academy Center’s theater in Exeter, N.H. is underway. The job started two months ago and will expand the space to 63,000 square feet. Four months ago, O’Connell began working on the $9 million Dartmouth College Hood Museum expansion and renovation project, which involves a restoration and addition to the existing gallery space. When it is finished by the end of next year, there will be five new galleries and advanced technology classrooms. The company also has a few smaller jobs, including a renovation project at the Culinary Institute of America in Poughkeepsie, N.Y.
Another project in that state is at the Trinity-Pawling School, where O’Connell began working on a 27,000-square-foot addition to the Smith Field House about a month ago that will be complete sometime next year. “It will be used for basketball, lacrosse, and other sports,” Bardell said. In addition to jobs in the educational sector, O’Connell has projects in other realms. Six months ago, it began a $29 million dollar upgrade to an existing wastewater-treatment plant that serves Mansfield, Foxborough, and Norton in the eastern part of the state. Work on the MFN Regional Treatment Plant entails installing new aeration facilities, chemical facilities, and electrical upgrades as well as concrete work, and is expected to take another two years. O’Connell is also doing a $17 million project in Providence, R.I. on the Providence River Pedestrian Bridge that connects two sides of the city and includes sections of a riverfront park. The majority of Gagliarducci’s projects take two to three years to complete. “We’re usually the first on a site and the last to leave it. But it is a challenge to predict a year ahead of time exactly when we will be needed,” Jay said, explaining that schedules change from one month to the next, and although the end date is usually firm, weather and production by other trades affect the timetable. Right now, all of the company’s work is institutional, and there has been plenty of it. It just finished an addition at Baystate Franklin Medical Center in Greenfield and started one at Baystate Wing Hospital in Palmer that will open in 2018. “We dig the foundations and put in sewer, water, and drainage systems, which is work that people don’t see,” Jerome explained, adding that such work takes place at the start of a project, while work at the end of a project involves paving, curbing, sidewalks, and more. Galiarducci has also broken ground at the site of the new Pope Francis High School in Springfield, which is slated to open in the fall of 2018. This school is being built on 40 acres of open space, which is unusual in this area; most of the company’s projects involve working in or around existing structures. List of General Contractors in Western Mass. The company was just hired to undertake work in a massive renovation of what’s known as Building 19 at Springfield Technical Community College, and that job will carry over into 2018. Gagliarducci worked with O’Connell on the Amherst College greenway residence project, and will complete phase 1 of another large project at the Isenberg School of Management at UMass Amherst this month, which involves relocating water, sewer, and drainage lines in the footprint and moving them to allow for new construction. Although the work may not sound complex, renovations and additions in tight spots can be quite challenging. “UMass presented real challenges because we had to work around the student traffic,” Jay told BusinessWest. Deerfield Academy has also hired the firm to do site work for a new hockey arena. The project began in March and will be completed in 2018. “It involves a lot of digging inside the foundation to support the renovation,” Jerome said, explaining that the firm will put in new sewer lines, curbing, and a parking lot. Later this winter, it will begin a drainage project at Springfield Armory Museum. This is a federal project, as the museum is owned by the government, and will include new sewer lines and curbing, sidewalks, and pavement. The work should be finished by the end of next year. “We’re also starting phase 2 of an over-55 community in Hadley,” he noted. The first phase consisted of building seven or eight units, most of which have been spoken for, and the second phase will commence next spring when Gagliarducci will do site work to allow additional housing units to be built. The company is also involved with the new South End Community Center in Springfield. Jay noted that Fontaine Brothers is building the new center on Marble Street and his firm is doing the sitework, which began in September. Westfield’s Gaslight District Improvement Project is also on Gagliarducci’s roster. “It was our job to put in the water, sewer and drainage lines, as well as the sidewalks, curbs, and two parking lots, in addition to reconstructing several streets,” Jerome said, explaining that the project began two and a half years ago and involves major reconstruction in the area. Forish Construction has a mix of ongoing projects that include the new $4 million Westfield Transit Pavilion at Elm and Arnold streets. The glass and steel building will have five bus berths, a shelter for passengers, a coffee shop, and administrative offices, and will be surrounded by brick walkways. Parking will be available in an adjacent facility, and there will be repair stations and racks for bicycles. “It is the first major piece of the city’s long-term downtown redevelopment plan that will be completed,” Forish said, noting that the pavilion will be LEED-certified. Several buildings were knocked down to make way for the new pavilion, which will make it more convenient for Westfield State students to travel to and from the university via a shuttle that runs between them. The company has also several projects underway or that have been recently completed at UMass Amherst, including a roughly $4 million renovation to the W.E.B. Du Bois Library. “It is our third major project in this library, which they are redoing floor by floor,” Forish said. Auto dealerships rank high on the company’s list of projects, and include work for Sarat Ford, Curry Nissan, and Sarat-Lincoln. “We’re just wrapping up a renovation and addition to Lia Chrysler on King Street in Northampton,” Forish said, noting it is adjacent to Lia’s Honda store. No one can predict the future, but work has been steady for Forish and other commercial contractors. “We have a number of projects already under contract for 2017,” Forish said, noting that they include auto dealerships as well as private industrial buildings and the company is always active in the public sector and plans to bid on some local projects. He told BusinessWest his optimism stems in part from the fact that Donald Trump is the new president-elect. “It appears he is business-friendly and wants to see growth in U.S. and an increase in jobs here as opposed to abroad. We are already seeing a rise in the stock market, and people are optimistic about the direction the country is headed in, so we are hopeful that good things will come to fruition,” Forish said. In the meantime, commercial contractors will continue to work hard to complete current projects, bid on new jobs, and rely on the stellar reputations that have kept them busy for generations as they plan for the New Year and beyond. As Springfield Technical Community College commences a year-long 50th-anniversary celebration, a landmark historic restoration project is taking shape — with the accent on ‘landmark.’ So-called Building 19, a 700-foot-long warehouse that predates the Civil War, is being converted into a campus center, a project that will enable the past and present to co-exist in a powerful fashion. Tom Duszlak says he’s heard all the rumors. Actually, they’re more like legends. And some of them are fact. Like the story related to him about the construction crews that, while working to set oil tanks at what is known as Building 32 on the campus of the Springfield Armory more than a half-century ago, unearthed bones belonging to soldiers from the War of 1812. “They were digging out the floors to put in these storage tanks when they came across some skeletons,” said Alex Mac-Kenzie, curator at the Armory, noting that, in the early 19th century, Building 32 was a barracks. An influenza outbreak swept the region, killing several soldiers, and they were buried right on site. There are many other stories concerning people finding bones, uniform fragments, tools, and other items on the grounds during various building projects, and the validity of some tales is a matter of conjecture. But Duszlak says there is absolutely no debating the underlying (pun intended) sentiment regarding this historic site, chosen more than two centuries ago by George Washington: that one never really knows what might be found in the ground there. Tom Duszlak says the Building 19 projects comes with a healthy list of challenges, including uncertainty about what crews may unearth at this historic site. And that’s just one of the many challenges confronting Hartford, Conn.-based Consigli Construction, which Duszlak serves as project superintendent, as it takes the lead role in an ambitious, $50 million project to convert the cavernous structure known as Building 19 (right next door to Building 32) into a new campus center for Springfield Technical Community College. Actually, crews have already unearthed some “artifacts” (Duszlak’s word) while undertaking some extensive infrastructure work at the site. “We found some cow bones and a few pieces of metal that might be part of an old piece of manufacturing equipment,” he said, adding that the ‘we,’ in this case, is mostly a reference to the full-time archeologist — hired by the National Park Service, which manages the Armory site — who is on hand whenever crews dig deeper than four inches. And there’s been a lot of digging to date, with most of it still to come — this building is 700 feet long, said Duszlak, adding quickly that, while a small part of him wants to unearth something intriguing — “I’d love to find an old cannonball or something like that” — the project superintendent in him is more pragmatic and fully understands that finding ordnance, let alone old soldiers’ bones, would mean potentially lengthy delays in an already-demanding project. 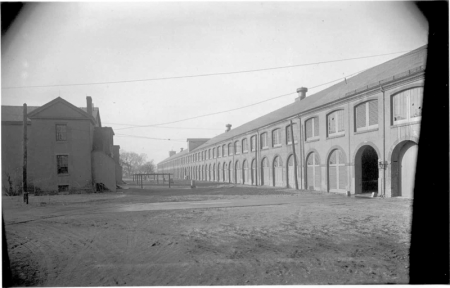 As mentioned, the fact that the Armory grounds could be described collectively as an archeological site is just one of the challenges facing Consigli, Ann Beha Architects, the state Division of Capital Asset Management and Maintenance (DCAMM), and STCC administrators as they proceed with this project. Others include the reality that this mammoth initiative must play itself out on a crowded college campus populated by 8,000 students and another 1,000 faculty and staff; that the site’s infrastructure, complete with some brick water lines, is quite old and mostly in need of replacement; that the work is taking place, in part, on a road system designed for horses and buggies; and that, with every bit of digging or restoration work, unforeseen problems may arise. But the challenges ever-present in this project to convert what amounts to a 19th-century warehouse for walnut gun stocks into a thoroughly wired, 21st-century community-college nerve center, are also what make it so intriguing, and so rewarding. George Faber, project designer with Boston-based Ann Beha working on the Building 19 project, agreed. For this issue and its focus on construction, BusinessWest talked with Duszlak, Faber, and others involved with this project — which is historic in every sense of that word — to get a sense for all that’s involved with an endeavor that has been centuries in the making — quite literally. As he and others gave BusinessWest a quick tour of the Building 19 construction site, Faber stopped to point out a few of the original wooden shutters, or louvers, that graced the dozens of arches and curved windows that give the structure its unique identity. Crews will replicate those features, and be meticulous in their efforts to match the material, look, and original color — something that was difficult to determine, Faber explained, adding that some of the originals that are in good shape will be restored and put back in place. Thus, there will be an effective blend, or co-existence, if you will, of old and new, which, in a nutshell, is what this project is all about. In construction circles, this kind work is considered a specialty, both for the architects and the contractors. And both Consigli and Ann Beha Architects have deep portfolios of similar projects. Consigli, for example, has handled a number of projects in the category it calls ‘landmark restoration,’ including one unfolding just a mile or so, as the crow flies, from the STCC campus. This would be work on the headquarters building of the former Westinghouse complex on Springfield’s east side, now the home of the massive assembly plant being built by Chinese rail car maker CRRC MA. Other projects in the portfolio include an elaborate restoration of New York’s historic Capitol Building, which dates back to 1867; restoration of the Smithsonian American Art Museum’s 19th-century Renwick Gallery; renovation of three historic buildings on the Trinity College campus in Hartford; and work to restore the exterior envelope of Maine Medical Center in Portland, opened in 1874. Ann Beha Architects, meanwhile, has undertaken many historic preservation and restoration initiatives on college campuses, including MIT, the University of Chicago, Yale, Bates, and others. 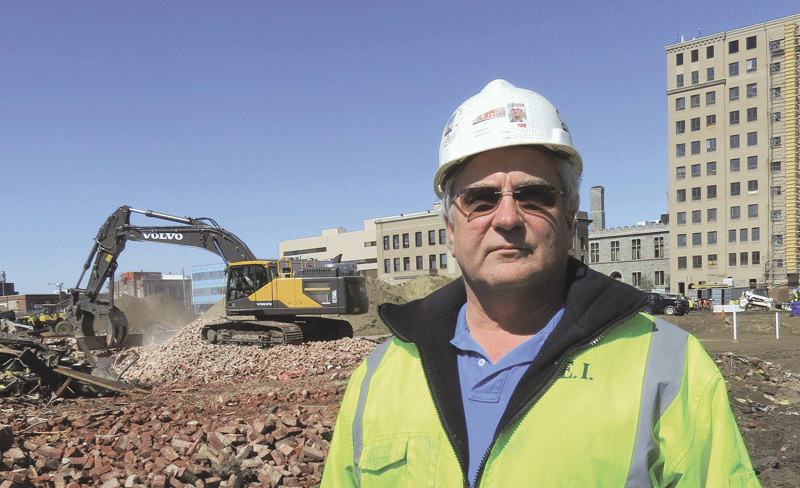 This is the first project for both firms on the STCC campus, which means crews have undoubtedly absorbed a number of history lessons — and heard a number of stories, like the one about soldiers’ skeletons being unearthed — while taking on this ambitious undertaking. They know, for example, that the buildings they’re using to stage and manage this project (as opposed to the traditional trailers that dot most construction sites) were once officers’ quarters dating back to the Civil War. By then, of course, the Armory had accumulated almost a century of history, having opened its doors in 1777. Chosen by Washington in part because the site would be safe from naval bombardment — Springfield is located just north of a waterfall in Enfield that cannot be navigated by ocean-going vessels — the Armory did, nonetheless, come under attack. Sort of. This was Shays’ Rebellion in 1787, a quickly crushed insurrection — one that nonetheless helped inspire the Federal Constitutional Convention — led by Pelham farmer Daniel Shays, a Revolutionary War solider who had gathered a number of rebels who, like him, were upset with their financial plight and thus the state’s government, and decided that seizing the arsenal in Springfield would certainly get someone’s attention. At its height, during World War II, the Armory would employ more than 14,000 people making M1s and a host of other weapons, but two decades after that conflict ended, Defense Secretary Robert McNamara — earning himself an ignominious place in Springfield history — determined that private defense contractors could manufacture the nation’s weapons. He ordered the decommissioning of the Armory, putting more than 2,000 people out of work, a decision that would damage the local economy but also pave the way for the site’s next life. The Founders Day speeches will be delivered in the gym in Building 2 on the STCC campus (a.k.a. Scibelli Hall). Those taking them in will need to look only a few dozen yards to the north to see the beehive of activity at ‘19,’ as it’s known colloquially. Unlike other Armory structures, especially its main administration building, now named after Garvey, 19 has not had any significant role with the college since it was formed, other than as a warehouse for equipment that was no longer needed but couldn’t be discarded. All that is about to change, though, and in a big way. Indeed, the renovated structure, due to open in the fall of 2018, will be home to a wide array of offices and facilities now scattered across the campus, including the library, admissions, registration, financial aid, the bookstore, the welcome center, student government, the parking office, health services, student activities, a café, the IT help desk, meeting and conference space, and much more. This collection of facilities will be called the Learning Commons, and if that sounds like a lot to put under one roof, remember that the roof of 19 covers a building longer than two football fields, complete with the end zones, and there are two full floors and a loft third floor. As noted, converting a structure that large, built a century and a half before the Internet was conceived, 40 years before the lightbulb, 35 years before the telephone, and 80 years before air conditioning (and thus not designed for any of the above) — all while maintaining its original architectural elements and being on the cutting edge of energy efficiency (LEED Silver designation) — will be a stern challenge. This will require, as Faber noted earlier, coexistence of the old and the new, because they’re both vital, but for different reasons. “From a design standpoint, it’s really about respecting the tradition of the building,” he explained, adding that this can and will be done, while also making the facility ‘green’ and state-of-the-art with regard to information technology. Duszlak said there are a number of stages to the project, many of which will be carried out concurrently. Late this spring, work began in earnest on infrastructure, what he called the “enabling phase,” including water, sewer, and electrical lines. He added that crews made the very most of the three months when the student population is greatly diminished, with the goal of minimizing disruption when they return this week. Maureen Socha, director of Facilities for STCC, said the project represented an opportunity for the college and DCAMM to greatly improve an aging, and often failing, infrastructure system, one that has been seized. While infrastructure work continues on a smaller scale, restoration work on both the exterior and interior of the building have commenced, with the goal of preparing the structure for the extensive build-out work that will follow to create offices, a library, a café, and gathering spaces out of what was a cavernous warehouse. There are many elements to this blend of restoration and renovation work, ranging from cleaning and repointing the hundreds of thousands of bricks to matching (after first determining) the original color of those louvers. And in a way, the louvers are a microcosm of the project’s many challenges and the huge amount of research and even lab work that goes into such preservation and restoration efforts. Research has involved poring over hundreds of old photos from not only the Armory but the Library of Congress, he went on, adding, again, the goal is a modern, energy-efficient facility that nonetheless pays respect to the building’s historic look and role. Soon, work will commence on a 3D coordination of the space, said Duszlak, adding that this will enable crews to make sure all the mechanicals — plumbing, electrical, and HVAC services — are properly coordinated and there are no conflicts. Looking ahead, Duszlak noted that there is considerable digging (maybe 75% of the total for the project) still to be undertaken at 19 and its larger footprint. “We have new structural upgrades that we have to dig foundations for,” he explained, “and we have electrical utilities that run the complete 715-foot length of the foundation. There’s new under-slab plumbing and drainage that services new bathrooms … we’ll be doing a lot of digging four to seven feet down. “So there’s the potential for finding a lot of really cool artifacts,” he went on, adding that, while he doesn’t want to encounter anything that might hinder progress, he wouldn’t mind creating some new stories — or legends. That’s what can happen when the past, present, and future come together in such dramatic, and historic, fashion. 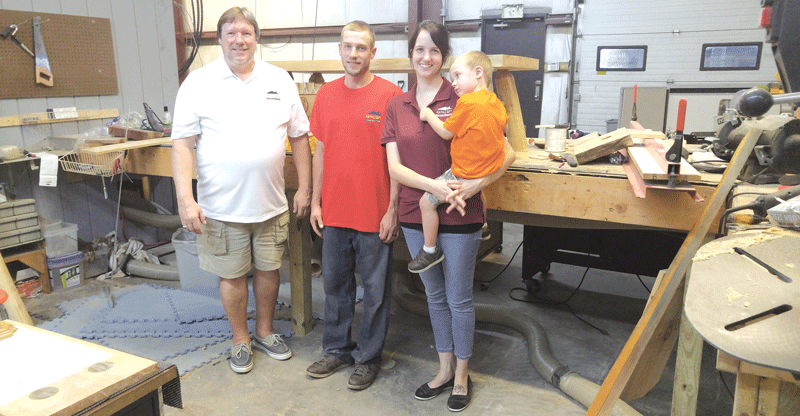 From left to right, three generations of the Roy family: Keith, his son Josh, his wife Jamie, and their son Bentley. And those words are far more than a catchy phrase to Roy; they form the basis of a value system that pervades his company and leads to attention to detail that customers never know about because many of the things they do cannot be seen. But the pride and satisfaction that Roy takes in “doing things the right way” has helped the company thrive during its 60-year history. The business focuses on residential work that includes a handyman repair service; installing windows; installing and repairing roofing and siding; basement conversions; attic remodeling; home additions, remodels, and renovations; and other major projects. “We work closely with each homeowner, and are willing to make changes at the drop of a hat,” Roy said, explaining that, after a project has started, people sometimes decide they want something different than they initially agreed upon or planned. Such changes are not problematic, because one thing that sets the company apart from many of its competitors is that Roy does not use subcontractors, with the exception of licensed plumbers, electricians, and excavators. His employees are paid by the hour, and since they remain at the job site until the project is done and meets his exacting standards, they don’t rush and never have to wait for a subcontractor to show up. Again, because Roy is focused on “doing it right,” his employees go above and beyond what is required or mandated by the building code. For example, when they build a deck, which comprises a healthy share of their business, Roy insists on using ceramic-coated nails because he says new decking materials are corrosive to metal and the more-expensive nails prevent them from popping up later on. In addition, he uses copper flashing instead of using aluminum flashing where the deck meets the house because it doesn’t corrode. “The building code doesn’t require it, but it’s the right thing to do,” Roy said, as he used the phrase that would occur repeatedly throughout the interview. In addition, stainless-steel nails are used on cedar products instead of galvanized ones, as the latter can lead to black streaks as the wood weathers. “The stainless-steel nails are four times more expensive, but we do things correctly with quality products while keeping the cost as reasonable as possible. It’s what people expect, but not what they always get, and it not only prevents future complaints, it satisfies the customer’s vision,” Roy told BusinessWest, adding that the company does a lot of repeat business and recently got a call from a customer he worked for 15 years ago who kept his contact information for more than a decade. Every employee must meet expectations, and although they must be qualified and experienced to be hired, Roy puts them through more training before they are sent to a job site. His son, Josh Roy, is vice president of the company, and had to work his way up the ladder before he was put in charge of overseeing jobs. But he shares the same belief system. “I like the satisfaction I get from making people happy,” Josh said. “We take pride in what we do, and many newly hired people have told me they are impressed by the quality of work we expect from them. For this issue, BusinessWest takes a look at the history of this Westfield construction company, why it continues to grow, and how it has weathered several recessions and come out on top. John L. Roy Construction was born in 1946 when Keith’s father returned home from the Navy after the end of World War II. He set up shop on Main Street in Springfield with his brother and began doing residential and commercial projects. Keith’s mother, Elaine Roy, served as office manager, and although his uncle left the business after the first few years, his parents did well, and the construction firm thrived. Keith began working at age 12, and already knew so much he was able to install a composite ceiling in his uncle’s home by himself. The following summer, he built a treehouse that featured a Dutch door, paneling on the walls, and a linoleum floor, and continued helping his father with the business. After graduating from high school, he earned a bachelor’s degree in accounting, became interested in marketing, and in 1980 was given the title of vice president of the company. 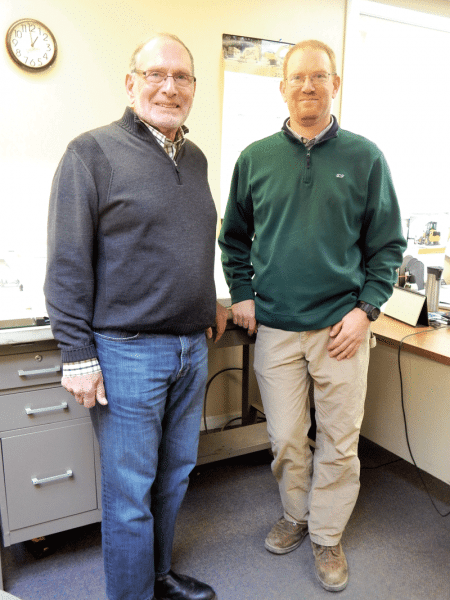 Three years later, John retired, and Keith changed the name of the business from John L. Roy Construction to Keith G. Roy Construction and took over for his father. 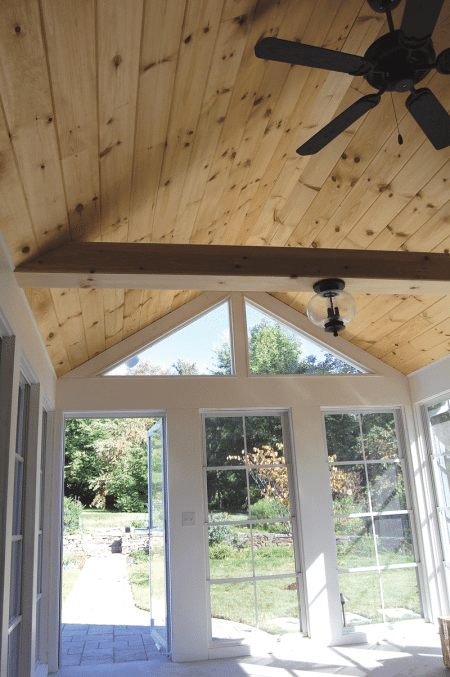 Keith G. Roy Construction created this three-season room with a 12-foot knotty-pine ceiling for a homeowner in Suffield, Conn. When the recession of the late ’80s hit, Keith downsized in many respects, moved the office into his Southwick home, and began working as a sole proprietor. Things improved considerably during the ’90s, and in 2008 Keith moved his business to its current location on Mainline Drive in Westfield. The Great Recession hit at about the same time, but he took the opposite strategy from most of his competitors and increased his advertising when others were cutting back, which not only worked but solidified his brand. “We’ve been growing steadily since that time,” Roy said. Josh Roy also began working in the family business at age 12 and joined the business in 2010. “I take pride in the work that we do and the fact that we get it right the first time,” he said, echoing his father’s long-standing work ethic and adding that job sites are kept clean, and when a project is finished, the employees get on their hands and knees to make sure everything is immaculate so the homeowner has nothing to do but move their furniture into the space and enjoy it. Part of the praise they frequently receive may be due to the fact that people understand what is taking place in their home, because sales manager Ken Faulker devotes time to educating each customer when he visits them to estimate a job or create a design plan. “Our employees are motivated by quality, rather than speed, because they are paid by the hour,” Faulker noted, adding that, although this is a small company, it operates like a large one. All employees are certified in their trade and adhere to best practices, the company provides in-house training to supplement skill sets, it has its own warehouse, and is a distributor of the American-made Starmark cabinets, which it uses almost exclusively in its custom-designed kitchens and bathrooms. Keith G. Roy Construction is also a dealer for Onyx countertops, which are made to order and look like marble or granite. Additions are a big part of the firm’s business, and Keith takes pride in making them look like the rest of the house. The crew just finished a 22-by-22 addition with a breezeway-style area that will be used as an in-law suite. It includes a kitchenette, living room, full bathroom, bedroom, and deck. However, the majority of the company’s recent work has been focused on remodeling kitchens and bathrooms and building decks. Many of the decks are on local lakes with sweeping views and are multi-story structures with hidden or grand staircases that contain landings and seating. For example, the company just finished a 700-square-foot deck over a walk-out basement that overlooks a lake and has a rain-removal system beneath it. Josh Roy says that using their own crew rather than subcontractors allows them to address problems or concerns a homeowner may have immediately. “They can talk directly to us instead of having to talk to a subcontractor who is only responsible for a specific part of the job,” he explained. Keith G. Roy Construction was named “Best Contractor” and “Best Bathroom Remodeler” in the Republican’s 2015 Reader Raves, and has an A+ rating from the Better Business Bureau. The Roys are proud of these ratings, like the challenge of knowing every job will be different, and enjoy giving customers more than they expect. To that end, the company offers the Keith Roy Guarantee, which ensures on-schedule completion, a cost-effective process from beginning to end, a final product that exceeds expectations, and honesty, integrity, and great value. “We want to form good relationships and are proud that our business is in its third generation, which helps us guarantee our work long into the future,” Keith said. 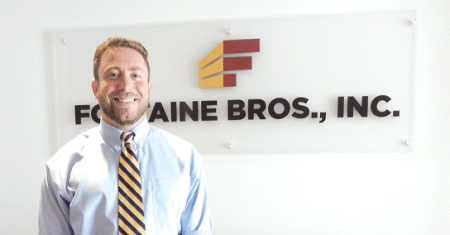 David Fontaine Jr. says Fontaine Bros. has a good mix of new construction and historic renovation work lined up. The building industry has travelled a tough road in its efforts to recover from the Great Recession, with mostly modest improvements in business volume amid ever-mounting competition for available work. But in recent months, the skies have become brighter, and most builders are expressing real optimism that the better times are real and have some staying power. It’s easy to notice major commercial construction projects underway during the summer, and this year is no exception. Business is booming, and local companies say they are doing well — one is actually having a record year — but competition is stiff, and it takes a good track record to get hired in today’s market. 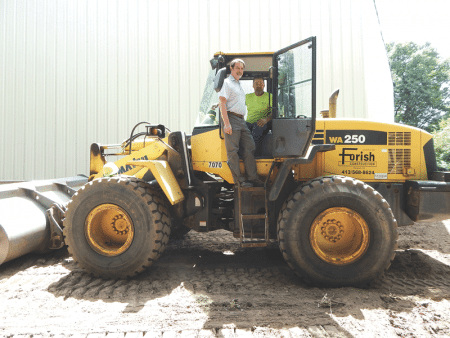 Eric Forish, president of Forish Construction Co. Inc. in Westfield, said his company has also been fortunate. “The past two years have been our best out of 70 years in business, and the forward momentum is continuing,” he told BusinessWest. Although Keiter Builders Inc. in Florence has been very busy and has a number of projects underway, it is also aware of the high level of competition and what it takes to prevail in a contest for a job. However, the firm deliberately searches for challenging and complex projects. Stephen Greenwald, president of Renaissance Builders in Gill, says there is considerable work available across the board in residential, industrial, and commercial sectors. “We’re busier than we were last year and have work through the beginning of next year,” he said, noting that it used to be like that 10 years ago, but hasn’t been that way for a long time. The type of work the company handles varies; about 50% to 60% is commercial, 30% is residential, and 10% to 15% is industrial, although the numbers change from one year to the next, and Greenwald agreed that landing jobs is highly competitive and a number of factors enter into the equation. Fontaine said his company is frequently hired to do construction management. “We help throughout the design process and are involved long before the actual construction work begins,” he said, explaining that the firm works in conjunction with the architect and owners, helps with the budget, and makes sure the job starts on time and stays on budget. Most projects are several years in duration, and landing them is no easy feat. Eric Forish (standing) spends a moment with Michael Oakes at Super Brush in Springfield, where Forish Construction Co. is putting on a 12,000-square-foot addition. Fontaine Bros. has a number of projects that were recently completed as well as ones that are underway or in the planning stages. It recently finished a historic renovation of the 100,000-square-foot, $33 million Shrewsbury Public Library that involved keeping the front of the building and adding 40,000 square feet, and it’s finishing a new elementary school in Athol. 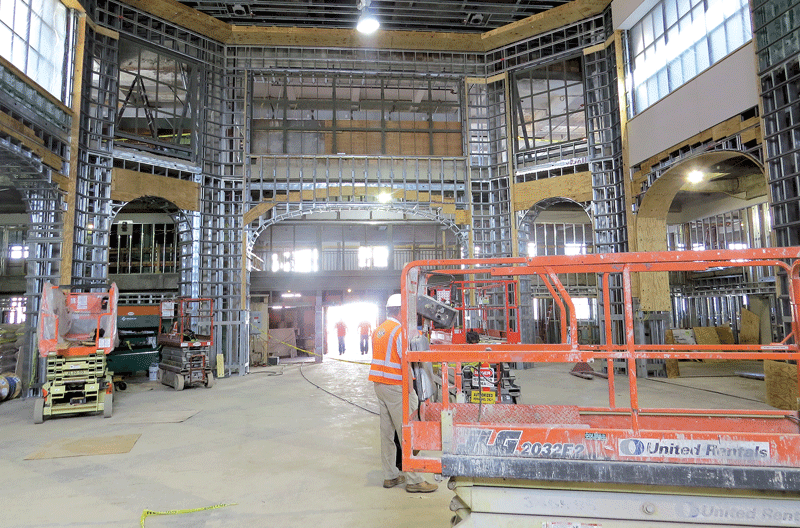 Local work includes the $55 million Pope Francis High School being built by the Diocese of Springfield on the grounds of the former Cathedral High School on Surrey Road in Springfield that suffered extensive damage during the 2011 tornado. “The project is in the final design stages, and we expect to break ground in September,” Fontaine said, adding that many people have wondered when the work will begin and don’t understand how much has to be done behind the scenes before construction can start. “It’s a great project for us, and will put a lot of local people to work. I’m happy to see the school being rebuilt,” he added. The undertaking will take two years from start to finish, and the school is expected to open in September 2018. 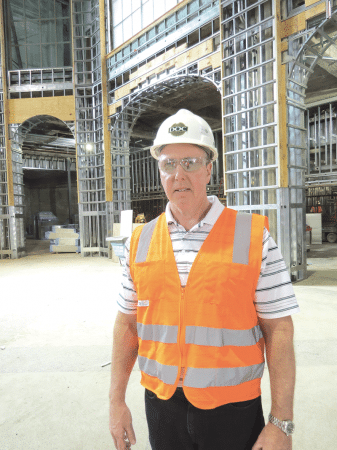 Fontaine Bros. is also working on the MGM casino parking garage in Springfield; construction is underway, and concrete was being poured at the time of the BusinessWest interview. The majority of work Fontaine Bros. handles involves ‘green’ building, and many of its projects are LEED- or Massachusetts CHPS-certified. The company has been ranked as one of the Top 100 Green Contractors by the Engineering News-Record for the past few years. Forish has also been busy. Over the past year, the company completed the new Sarat Ford and Sarat Lincoln auto dealerships in Agawam and the Marcotte Commercial Truck Center in Holyoke, put on a large addition at Astro Chemicals in Springfield, and most recently completed the Curry Nissan dealership in Chicopee and a new $6.5 million senior center in Westfield. Projects underway include the $3.5 million PVTA Pavilion in Westfield, a 30,000-square-foot addition to Hillside Plastics in Turners Falls, a 12,000-square-foot addition at Super Brush in Springfield, and a multitude of jobs at UMass Amherst. Keiter has a varied portfolio that includes a number of residential construction projects, and the firm is putting additions on a number of homes and building a few new ones in the Northampton area. However, about 80% of its work is commercial, and the roster includes a number of jobs at Smith College. The work includes a large window-and-door installation on the president’s house, a large dormer addition on a classroom building, and a renovation to another building to accommodate a gluten-free kitchen. The firm is also handling a major renovation of the Alumni Gym at Amherst College, which houses its athletic operations. “We’re very diverse, and also have a site division that does a lot of earthwork, which is a fast-growing part of our business,” Keiter said, adding that the firm began doing excavation and site work about three years ago. Last year the company also completed a number of jobs at Smith College. It finished a telescope observatory in McConnell Hall, put a new roof on the building, and made mechanical upgrades; repurposed space to create a scientific drone research room in Bass Hall for the Science Department; and did a good deal of office-renovation work. Is also handled a buildout for an attorney’s office in Northampton and created a new restaurant (ConVino) in the basement of Thornes Marketplace in Northampton, which required completely changing the layout of the space. 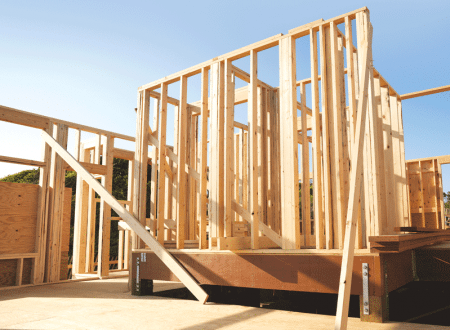 Renaissance Builders also has a large, diverse portfolio. Last year, the company completed a major church renovation in Greenfield, a significant renovation of an apartment building in Northampton, another major renovation of a food-distribution company’s warehouse in Hatfield, and an addition for a commercial cabinet maker in Northfield. And on the residential side, it built two new homes in Chesterfield and Montague. Forish attributes his company’s success to the dedication of his employees, but said the company’s longevity poses its own set of challenges. Although it’s impossible for commercial construction companies to predict what the future will hold, Forish and other company spokesmen say this year looks like it will be a good one. “But it’s always difficult to tell how much is due to the economy versus the typical busy summer, so we’re always looking ahead,” Keiter said. One that should contribute to a stellar season as local commercial construction companies not only hold their own, but thrive in a competitive environment where attention to detail and reputation makes a world of difference. Union Station’s Grand Hall awaits the final touches to its restoration. As he talked about the massive, $88.5 million Union Station redevelopment project, Richard Fairbanks made early and frequent references to its many stages, the critical sequencing of its various components, and the formidable challenge of handling this work while partnering with — and dealing with — a veritable alphabet soup of agencies and stakeholders. They range from CSX, the transportation giant that runs trains through the facility, to the SRA (Springfield Redevelopment Authority), which owns the property, to MassDOT (Mass. Department of Transportation), which is essentially calling most of the shots. ‘Complicated’ is probably the best adjective to describe this project, which has been, in some respects, three or even four decades in the making — that’s how long the 90-year-old station, built by the Boston & Albany Railroad, has been mostly vacant — but is now approaching the proverbial end of the line. Well, in most respects, as we’ll see. Indeed, the 377-space parking garage has taken shape with interior infrastructure work still to complete; the bus-berth area (there will be 27 bays for inter-city and intra-city buses) is nearing completion; and the long-anticipated work to return the interior of the station, and especially the so-called Grand Hall, to its former glory is entering its final stages, with framing completed and work on the finishes set to start. Richard Fairbanks says the Union Station project is complicated by its many stages and myriad stakeholders. Meanwhile, work on the large commercial spaces above and around the Grand Hall is continuing, said Kevin Kennedy, Springfield’s chief development officer and long-time driver of the project, adding that these areas are approaching the ‘white-box’ stage, from which it can build out to suit tenants’ needs and desires. But some of the work will not be done on schedule, due in large part to two more of those seemingly endless acronyms — in this case the ADA (Americans with Disabilities Act) and the FRA (Federal Railroad Administration). The former requires six feet of space on either side of the so-called headhouse on a rail platform (the structure at the top of the stairway to the platform and the elevator), and the latter recently refused to grant a waiver for the renovated Union Station and its planned five and a half feet of space. So it’s back to the drawing board in the real sense of that phrase, Kennedy said, adding that new designs, funded by MassDOT, will be drafted, and the platform should be completed about a year from now. But the station itself and the complex’s many components, from the parking garage to the bus berths, will be completed on schedule by the end of this year, with the landmark due to celebrate what should be a grand opening — or reopening, to be more precise — next January. Fairbanks, who succeeded Bob Aquadro as project manager earlier this year, has been with O’Connell for nearly 30 years, and has a number of large projects on his résumé, including the new courthouse in Taunton and work at Yale University, including a renovation of a music facility that is in many ways similar to the Union Station endeavor, right down to the terrazzo floor. Most of his recent work has been in the 413 area code, including the cancer center expansion and an addition to the women’s correctional facility in Chicopee. While he’s only been project manager on Frank B. Murray Way for several months, he knows the full history of the project, and said this initiative, which started more than four years ago, has been more complex than most because of its many stages, intertwined players at the local, state, and federal levels, and the unforeseen problems that come with working on a building opened a year before Charles Lindberg flew across the Atlantic. An architect’s rendering of the renovated Union Station. 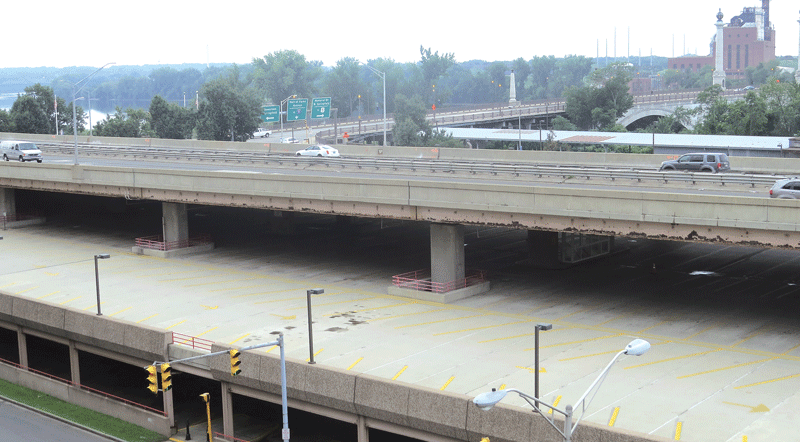 The primary challenge, though, is coordinating all the various steps in this project so that the work can proceed smoothly and without interruption, efforts that were helped by a mild, relatively snowless winter that enabled the parking garage to go up seemingly overnight. “This is essentially five projects in one — there are a lot of steps,” he said, listing the terminal, platform, parking garage, bus berths, and the extremely complicated process of waterproofing the terminal and tunnel that connects it to the platforms. But there is light at the end of that tunnel — figuratively, but also literally — and light in the tunnel as well. Indeed, as he walked and talked with BusinessWest while giving a tour of the construction site, Fairbanks pointed to the terrazzo floor in the terminal — perhaps the most celebrated original surviving element of the station (most of the original wooden benches that were due to be part of the restoration were reported stolen under mysterious circumstances). “This will be the last stage,” he said, noting that a firm that specializes in the restoration of such floors will start its work when virtually everything else is done. And it will be a fitting finishing touch, he said, noting that it will represent the capstone (at least when it comes to the terminal) of a project that has been historic in every sense of that word. American Environmental’s Tom MacQueen says employees of construction-related companies appreciate having steady work close to home. With construction on the MGM Springfield casino underway, plenty of local businesses — 40 to 50 over the next six to nine months — will have worked on the project in its first phase. But that’s just the beginning, say city and regional business leaders, who say MGM has forged a number of strategic partnerships to ensure that even more area companies — those in construction, but also providers of myriad other services — benefit from this $900 million effort. Construction is moving forward on the 14.5-acre MGM Springfield site between Union and State streets and Columbus Avenue and Main Street. About 70% of the footprint for the garage, casino, hotel, and outdoor space has been cleared, and about 45 local and non-regional companies have been employed during the process. Work to compact the ground and get it ready for the garage, which will be the first structure built, is taking place now. Demolition is also still occurring in the area where the casino and hotel will be built, and on April 19 the First Spiritualist Church was moved 600 feet from its former home on 33-37 Bliss St. in preparation for placing it on a new foundation. 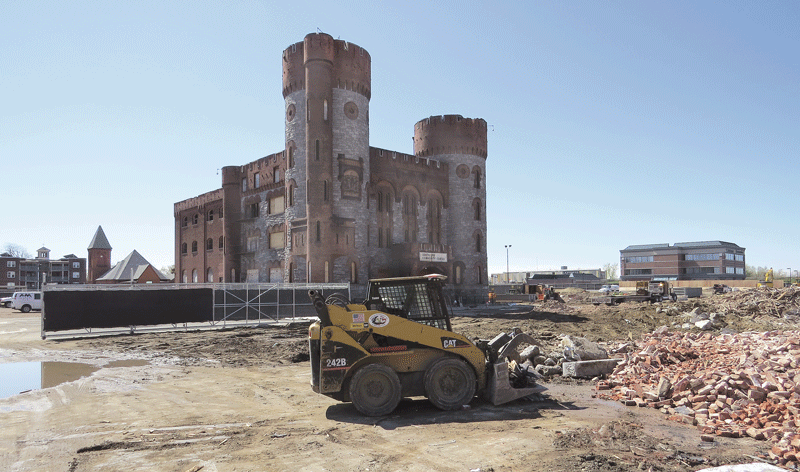 Brian Packer, MGM’s vice president of construction, told BusinessWest that one building and the rear portion of the State Armory still need to be knocked down. In addition, the rear of two structures, 73 State St. and the Union Chandler Hotel, whose historic front facades will be preserved, also still need to be demolished once the facades are secured and braced. Eric Nelson, vice president and project executive for Tishman Construction Corp., the general contractor overseeing the MGM build, said a concerted effort has been made to hire as many local subcontractors as possible in keeping with the project labor agreement, and they will continue to hire firms over the next 12 months. “A significant amount of the work has gone to firms in Springfield and the surrounding communities,” he said. Local businesses benefiting from the trickle-down effect include American Environmental Inc., a minority-owned Holyoke business which did a significant amount of abatement and some demolition; Ultimate Abatement, a woman-owned firm in Springfield, which received a large contract to do abatement on the former YWCA building; Gagliarducci Construction Inc., which handled site work; and New England Blue Print Paper in Springfield, which has contributed printing and copying services. Within the next six to nine months, Packer said, 40 to 50 local companies will have worked on the project, and the majority are in Springfield. Gerry Gagliarducci, owner of Gagliarducci Construction Inc., said he has had a crew on site since last year. 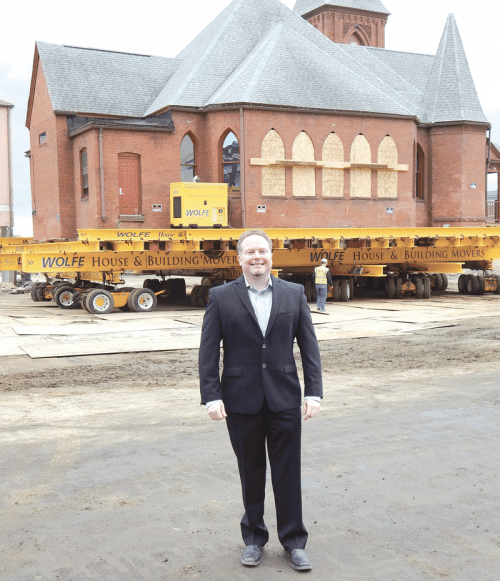 The company has done exploratory work for underground utilities, screened excavated materials for reuse on the site, and, most recently, conducted preparations needed to move the church. “We’ve enjoyed our relationship with MGM and Tishman Construction. This project is a big boost to the local economy and carries down to all areas of business, including fuel for vehicles, lunches, and major expenditures,” he noted, adding that workers with good-paying jobs may buy new automobiles or make other major purchases. Work for local firms has come about in part because MGM has been reaching out to the business community for several years to initiate strategic partnerships and discussions. They also participate in events such as the annual Western Mass. Business Expo, staged by BusinessWest, and have held informational sessions for contractors, which will continue before substantial work comes up for bid. 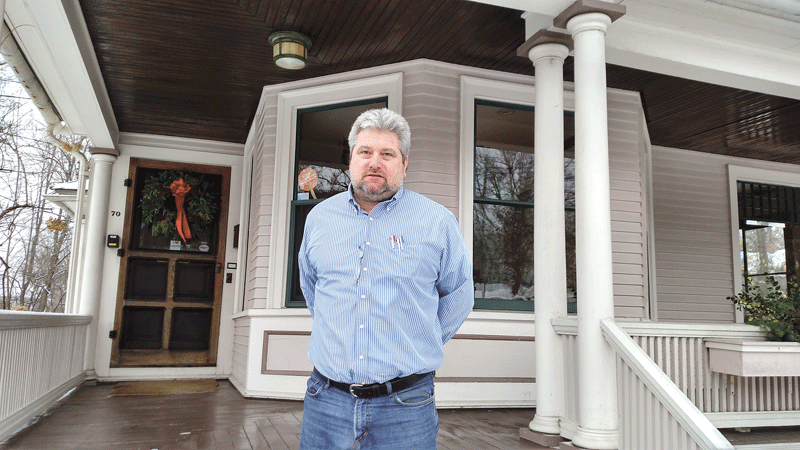 Brian Packer, pictured in front of the First Spiritualist Church during its 600-foot relocation, says MGM expects to reach out soon to local firms for electrical, mechanical, drywall, and other types of work. Local providers have also benefited. They include Caring Health in Springfield, which won the bid for the drug-testing portion of the contract and has tested every construction employee on the site, as well as Arrow Security Co. Inc., which has provided security services for the property since the construction began. At this point, the abatement and demolition is almost complete, site work is starting, and construction of the framework is expected to begin in the fall. Jeffrey Ciuffreda, president of the Springfield Regional Chamber, said his organization has an excellent relationship with MGM, and is working closely with the company to make sure local businesses benefit not only during the building process, but once the casino is operational. He noted that MGM’s agreement with the city of Springfield includes spending $50 million annually on local goods and services after it opens, but said the word ‘local’ is relative, and includes Hampden, Hampshire, Franklin, and Berkshire counties. So far, MGM has carried out its end of the contract and joined with the Springfield Regional Chamber to host two supplier and vendor fairs attended by its former vice president of global procurement, who came from Las Vegas to highlight opportunities for local businesses and provide strategies and insights for doing business with the casino. A vendor fair was also staged in Holyoke in conjunction with the Greater Holyoke Chamber of Commerce. Businesses doing construction work have to be unionized, but suppliers and service providers do not when the project opens. However, they do have to be registered with the Mass. Gaming Commission. Companies hired so far tout the benefits of the project to the regional economy. They include American Environmental Inc., which has done a significant amount of work on the project. It won the first abatement contract, has been working for MGM since last March, and since that time has been awarded a half-dozen additional abatement contracts and an equal number of structural take-down contracts that have included demolishing the former YWCA on Howard Street, which dated back to the 1900s and most recently housed the Western Massachusetts Alcohol Treatment Center; the former St. Joseph Rectory on Howard Street; and the Springfield Rescue Mission on Bliss Street, which relocated to the former Orr Cadillac building on Mill Street, which the casino resort provided in exchange for the mission’s former property. “It’s been a wonderful foundation project for the entire calendar year,” said Tom MacQueen, American Environmental’s general manager, adding that area employees appreciate having steady work close to home and MGM has done a great job identifying qualified, local contractors. In addition, American Environmental has been introduced to new contractors on the site and made arrangements to work with them in the future, which is an extra benefit of working on the project. T&M Equipment Corp. in Springfield is another local company benefiting from the ripple effect. The union-affiliated contractor was hired to do excavation work for the garage and hotel and has been on site for about a month. MGM is working to increase union construction workforce opportunities, and has convened a Community Partners Network, which has grown from nine to 21 members. The network holds biweekly meetings to identify ways to recruit diverse populations that meet union requirements and are ready to join a union or a union joint apprenticeship and training committee, and also recruit people who may not meet union requirements and need supportive services and soft-skills training. MGM has also met with a number of trade unions to share construction timelines, potential partnerships, and other issues pertinent to hiring. They include the Carpenters Union #108; the Painters & Allied Traders Council #35; Ironworkers Local #7; and a bevy of other groups. In addition, a construction diversity task force has been formed. Outreach continues, and MGM Springfield and Tishman are exploring the possibility of developing an ongoing partnership with Putnam Vocational Academy students interested in joining unions and working on the Springfield job site. The Springfield Regional Chamber created a list of members for MGM that could do construction-related work, and goals have been established by the Mass. Gaming Commission for doing business with certified minority-, woman-, and veteran-owned companies. Ciuffreda has also told MGM about local companies that manufacture windows and other supplies that will be needed during construction, and said officials have expressed real interest in them. With the $900 million project only in its early stages, MGM expects to involve many more local workers. “The door was open early on, and although we can’t offer our members any guarantees, as the construction unfolds we will make sure that MGM’s list continues to be updated,” he told BusinessWest, adding that MGM has divided chamber members into categories and given the list to contractors, who are encouraged to use local suppliers. “We’ve told our members that MGM is a world-class organization and is big on quality, quantity, and cost,” Ciuffreda noted, adding that some local firms may be too small to be competitive in terms of pricing or unable to produce the large number of items needed. However, the chamber has filed a grant request with the Gaming Commission that would allow it to provide technical assistance to businesses. Funds will be targeted toward minority-, woman-, and veteran-owned firms that wish to do business with the casino. MGM’s future needs will be seemingly endless, and goods and services needed will range from security to special hardware, signage, exterminators, alcoholic beverages — the casino has already agreed to work with local craft-beer producers — to food, which Ciuffreda said could be supplied by farmers in the Pioneer Valley. Other non-gaming vendors will include linen suppliers, garbage handlers, and limousine service companies. However, the majority of those firms won’t be hired for more than a year from now, when advertisements and meetings will provide interested businesses with the information they need. Ciuffreda said MGM will do well because it is a behemoth with an established history, but its future success will be measured by the impact it has on local companies. At this point, MGM is doing everything it promised, he noted, but the chamber will continue its quest to make sure its members benefit from the spinoff. For example, the chamber has a 100-page document listing items that MGM Detroit purchases, and Ciuffreda intends to sit down with officials and find out what is procured from national companies and what could be supplied locally to fulfill the $50 million annual agreement as things move forward. The global study, which received additional support from Saint-Gobain, the U.S. Green Building Council, and the Regenerative Network, positions the U.S. as a strong participant in the global green movement. Responses from more than 1,000 building professionals from 60 countries place the U.S. green industry in context. The study also provides specific comparisons with 12 other countries from which a sufficient response was gained to allow for statistical analysis: Australia, Brazil, China, Colombia, Germany, India, Mexico, Poland, Saudi Arabia, Singapore, South Africa, and the United Kingdom. 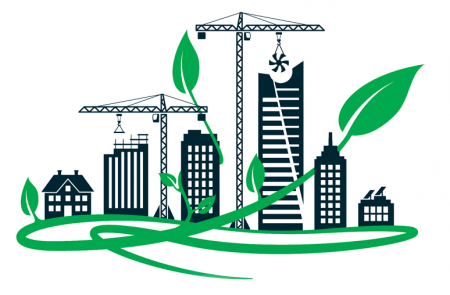 According to the report, U.S. construction should see an increase in the share of green work in the next few years, largely as a result of companies intensifying their involvement in the green-building industry. An increasing percentage of respondents projected that more than 60% of their projects would be green projects — from 24% of respondents in 2015 to 39% in 2018. Respondents projecting that fewer than 15% of their projects would be certified green plummeted from 41% in 2015 to 27% by 2018. While this increased share of green building is impressive, it is significantly less than many developing countries included in the survey. For example, Brazil expects six-fold growth (from 6% to 36%) in the percentage of companies conducting a majority of their projects green, five-fold growth is expected in China (from 5% to 28%), and fourfold growth is expected in Saudi Arabia (from 8% to 32%). • 43% of U.S. respondents plan to work on green retrofits of existing buildings, again well above the global average of 37%. The U.S. is also distinguished from the global findings in terms of the importance it places on reducing energy consumption as an environmental reason for building green. Over three-quarters (76%) of U.S. respondents consider this important, nearly double the percentage of the next most important environmental factor, which is reducing water consumption. While the other 12 countries in the study prioritize the reduction of energy consumption, only Germany, Poland, and Singapore do so to the same extent. The study demonstrates the benefits of building green, with median operating cost decreases for green buildings of 9% expected in just one year globally. 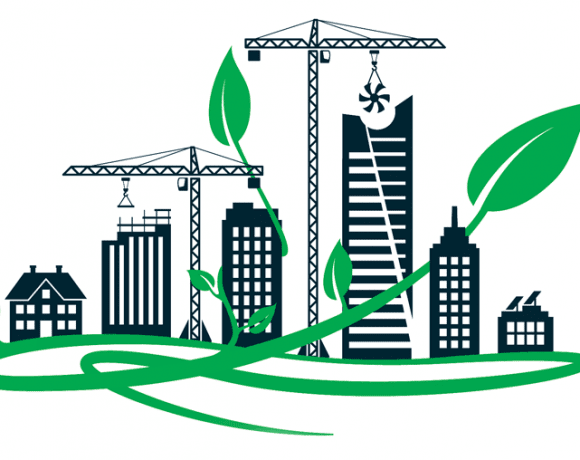 Building owners also report seeing a median increase of 7% in the value of their green buildings compared to traditional buildings, an increase that is consistent between newly built green buildings and those that are renovated green. These business benefits are a critical driver for the growth of green building anticipated globally. Dodge Data & Analytics, which prepared this article, is a leading provider of data, analytics, news, and intelligence serving the North American construction industry. The new Balise Hyundai in Springfield. Contractors who have made inroads in auto-dealership construction are finding these to be good times indeed, as area dealers, from solo stores to large chains, engage in what can only be described as a building boom. The reasons are myriad, from an improving economy to demands from car makers that showrooms have a consistent look, to changes in the way cars are purchased and serviced today, and how 21st-century dealership design reflects those shifts. If there’s one driving force behind all the auto-dealership construction and expansion over the past few years, Bill Peffer noted, it is, quite simply, a growing economy. Balise has been renovating and expanding in the area, most recently with a new Hyundai dealership on Columbus Avenue in Springfield, but with several new facilities over the past decade. Meanwhile, the Lia Auto Group has built and renovated new stores across the Pioneer Valley, as have TommyCar Auto Group in Hampshire and Franklin counties, Sarat Ford Lincoln in Agawam, Marcotte Ford in Holyoke, and Fathers & Sons in West Springfield, just to name a few. Indeed, according to MiBiz, a Michigan-based business website, the facility, training, and technology expenses required to run a modern dealership favor larger dealer groups that can share back-office resources and spread out narrow margins over higher sales volumes. Balise — which contracts with South Hadley-based Associated Builders on its Western Mass. construction and renovation — is certainly one of those large players. But more dealerships also means more challenges to stay on top of current trends. “They want to have more inventory, so parking areas get larger,” Forish said. “They want to be green-friendly, so they update their lighting fixtures in the parking lots; LED fixtures return tremendous savings from conserving energy. Then there’s the energy efficiency of the buildings themselves. There are a multitude of ways dealers try to stay current. Their products are new, and they want their facilities to be new facilities. But while area dealers focus on drawing in new business, manufacturers have their own ideas about what constitutes an ideal showroom and service center — and those changes are also helping to drive the current building boom. The trend among car makers is to standardize, to some degree, the look and feel of showrooms that sell their brands, and they are in some cases providing incentives — and in others, simply issuing mandates — to renovate and modernize their showrooms. These mandates can encompass everything from the exterior façade to the colors of the interior walls to the furniture where customers wait for service. Marcotte Ford’s new commercial truck center in Holyoke. As a partner with many different manufacturers, Peffer said, Balise is well aware of the demands they’re placing on dealers. For instance, the chain’s new Hyundai dealership on Columbus Avenue in Springfield boasts a six-bay express service element for customers who want to get in and out quickly, a separate cash-wash facility, and a ready-credit used-car space, all in separate buildings on the same grounds. Meanwhile, Fathers & Sons is currently building a dedicated showroom in West Springfield for Audi because that maker, like others, wants dealers to move away from the old ‘auto mall’ facility that sells many different nameplates under one roof, to reduce the chance of a customer driving away with another maker’s product. Audi has also provided direction on the new facility’s design, what it calls a ‘terminal’ concept with an aesthetic dominated by glass and metal. These areas are typically marked with signage explaining the pricing for a range of basic services, another attempt to be transparent with customers who have likely already done their homework on the Internet. “The nature of doing business as an auto dealer has changed, as well as the type of service they offer and the nature of customer-service relationships,” Forish added. “If you’ve taken your vehicle in for service at a newer dealership recently, you realize that, at most of these places, you drive into a building and are greeted by the service writer that reviews the scope of repairs or maintenance you’re going to receive. Then you go relax in these wonderful customer lounges, which have high-definition TV, wireless access for your devices, and play areas for the kids. As manufacturers ramp up mandates for standardization in their showrooms, MiBiz notes, some dealer groups have resisted the change. A 2013 study by auto-industry consultant Glen Mercer found that, while expansion of showrooms and service departments can pay off on the bottom line, other modernization efforts bring little return on investment. Still, customers appreciate changes aimed at improving their experience, Peffer said. “More and more people start shopping for prices online, and by the time they get to the dealership to make the purchase, they’re there to buy, as opposed to just kicking the tires,” he told BusinessWest. “They get all their information online, and by the time they hit the showroom floor, they’re looking for a good experience. On those points and others, too many dealerships built decades ago simply fall short. That, in turn, should continue to provide plenty of opportunity for contractors looking for a hot niche to drive new business.